The Stages Power meter is primed to bring power-based training to all disciplines of performance cycling. 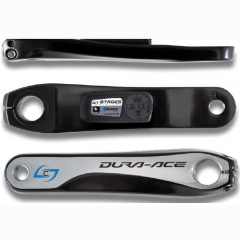 With advanced technology and simple elegant design, the Stages Power meter is perfect for any cyclist whether looking for their first power meter or a savvy power-training expert wanting to add power measurement to a second MTB, ‘cross or DH bike. Regardless of what piqued your interest in power measurement, you’ll find the Stages Power meter to be the lightest, smallest, most technologically advanced unit available today. No matter your cycling passion — we have a Stages Power meter for you. Our power meter may be small in stature, but it packs a technological wallop. Our Stages Power meter is downright miniature. The 20g unit houses an array of high technologies adapted from the rapid advancement of modern electronics. Our accelerometer based cadence measurement is possible due to the technology’s development for use in smart phones. We’re especially excited about the Stages Power meter’s bilingual communication between both ANT+ and Bluetooth Smart protocols; the latter gives us the ability to ‘future proof’ this power meter with the ability to update its firmware over the air using an iPhone 4S or iPad 3 (or later) devices, while also keeping its housing impenetrably sealed to the elements. Ultimately, we believe the Stages Power meter offers the most advanced technology of any power meter currently on the market, yet is one of the easiest to install, maintain, and simple to use.